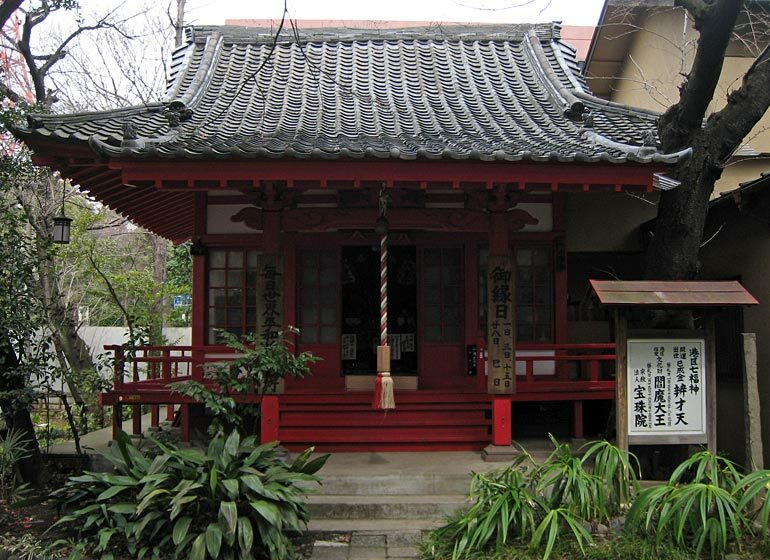 The small temple of Hojuin houses Benzaiten. Please put your cursor on the opening to see Benzaiten more clearly. Shichi-fukujin (Seven Gods of Fortune or Seven Lucky Gods) are popular in the Japanese folk belief. Nobody knows the exact origin of Shichi-fukujin, but it is sure that deities who were thought to bring material happiness to humans were picked up either from Buddhism, Hinduism, Taoism or from Japanese own local belief during the course of history and put together in a group of seven at the beginning of the Edo Era (1603-1867). Traditionally Shichi-fukujin were not jointly worshiped in the same shrine or temple, but small shrines were built to worship one of the seven gods. Many shrines were built to enshrine one of the Shichi-fukujin in particular during the Edo Era. They usually exist in the ground of temples or shrines whose main buildings are occupied by more esteemed and important deities such as Bodhisattva and Susanoo-no-mikoto. I think that the smallness of the house for lucky gods expresses the humbleness of their believers. They must think that their petite happiness is not worth attention by those great Buddhas or gods, but by second or third ranking deities. I sometimes feel that this situation is comparable with the division of labor between Jesus and saints in the Roman Catholic Church. Generally speaking, Shichi-fukujin are not as popular as they were many generations ago. But, they are still so influential to be employed in the promotion of local communities or shopping streets. Municipalities and trade associations nowadays try to find out old temples of Shichi-fukujin and use them to attract people. As a result, Tokyo, for example, has about 30 groups of Shichi-fukujin who are housed in proper buildings designated for them. There are also shrines and temples which have statues or paintings of all seven deities and those Shichi-fukujin also attract visitors. Some municipalities put up new sculptures in their streets with the similar intention. Minato Ward, where I am working, promotes its "Minato Seven Gods of Fortune". Two of the gods are within the walking distance in the lunchtime break and I visited them. Toys and dolls are offered for the sake of lost babies. Benzaiten or Benten are enshrined in Hojuin. Hojuin is a sub-temple of Zojoji Temple. 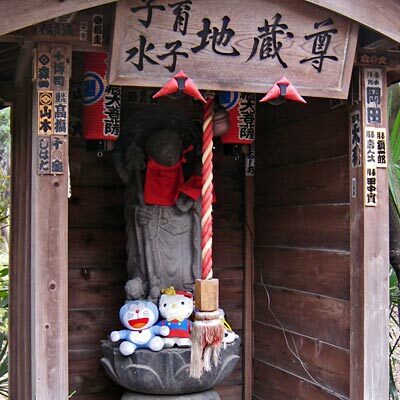 Benzaiten is the only feminine deity among seven lucky gods. Originally she was the god of river and later associated with music, performing art and richness. Hojuin was built in 1685 by the superintendent of Zojoji beside Byakuren-ike Pond. Though many old buildings are still preserved, a modern high-rise was built just behind its mud wall and Hojuin appears to be neglected. There are a small shrine dedicated to Myoken, god of polar star and military and a small hut for Jizo in the court. There are some other Jizo statues next to it. Jizo is a Bodhisattva which pays special attention to babies and children. These statutes must have been donated by parents who had lost their babies. Dolls and toys are offered in front of the statue show that the belief is still alive. Not far from Hojuin, there is Kumano Shrine where Ebisu is enshrined. According to the legend, this shrine was established around 1400. 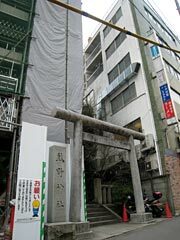 However, now a narrow and tall building is being built on the narrow land strip beside the shrine. It might be necessary to build an ugly concrete building and ensure the income to maintain the shrine. However, it looks miserable and blaspheming against the god, I believe. Many shrines and temples in Tokyo gradually lose their contacts with the soil. I cannot but feel that it means the death of gods and the loss of belief.